What do you know about waterspouts? A mesmerizing vortex that spins down from a cloud to the surface of the ocean is one description of a waterspout. A starker definition is that it’s a tornado over water. Waterspouts may beguile you with their ephemeral beauty, but they pose a serious hazard for boats and a threat to anyone in their path if they come ashore. From a scientific viewpoint, there are differences between tornadoes and waterspouts. 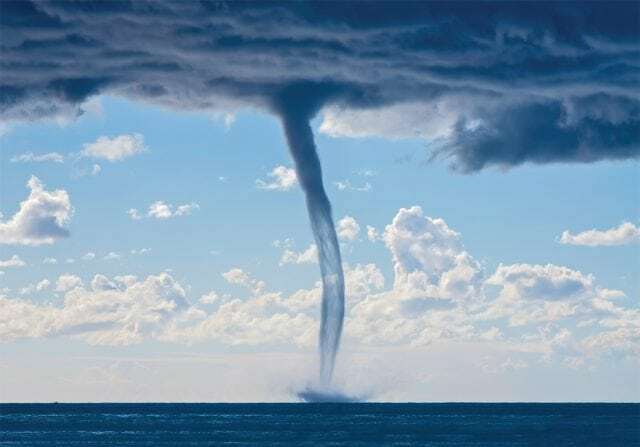 Waterspouts can be broken down into two categories: the weaker and more common fair weather waterspouts, and the much stronger, but far less common, tornadic waterspouts. Fair weather waterspouts can occur without a “parent” thunderstorm. They can develop underneath tall cumulus clouds that are very common in the warmer months. 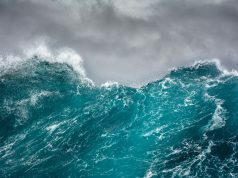 Usually, they are relatively small, typically a few hundred feet across or less with average wind speeds near 50 miles per hour. They may only last a few minutes, but the largest ones can go on for an hour. They also often move slowly or are stationary for a time. The first indication of a circulation is a dark spot on the water surface. This is a low-level circulation that will develop vertically under the updraft of a growing cumulus cloud. The upper part of the funnel will become visible when water droplets condense as the vortex further develops (it isn’t water droplets being sucked up from below). This visible funnel may or may not reach all the way down to the ocean surface and even if it doesn’t, one should assume a surface circulation exists. 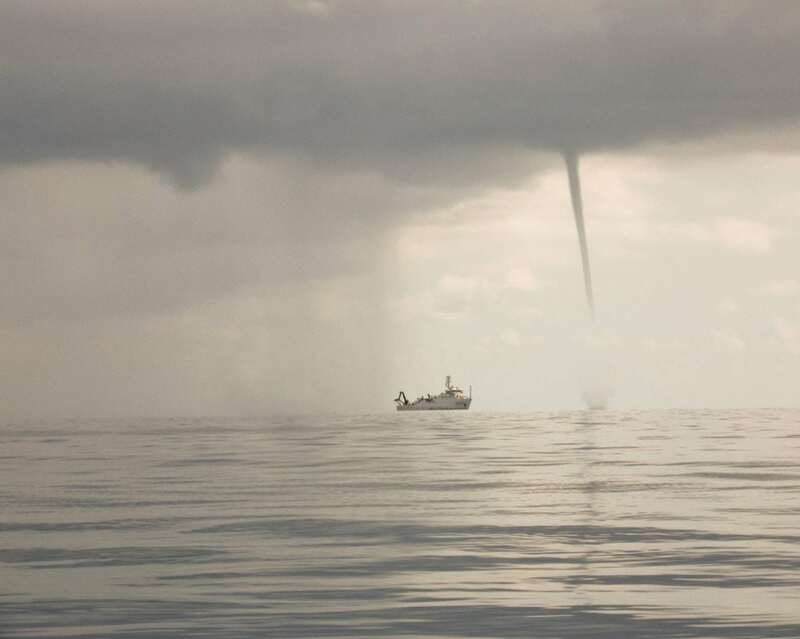 Waterspouts can occur virtually anywhere. They are not uncommon over the Great Lakes. They even occur over the offshore waters of Alaska. 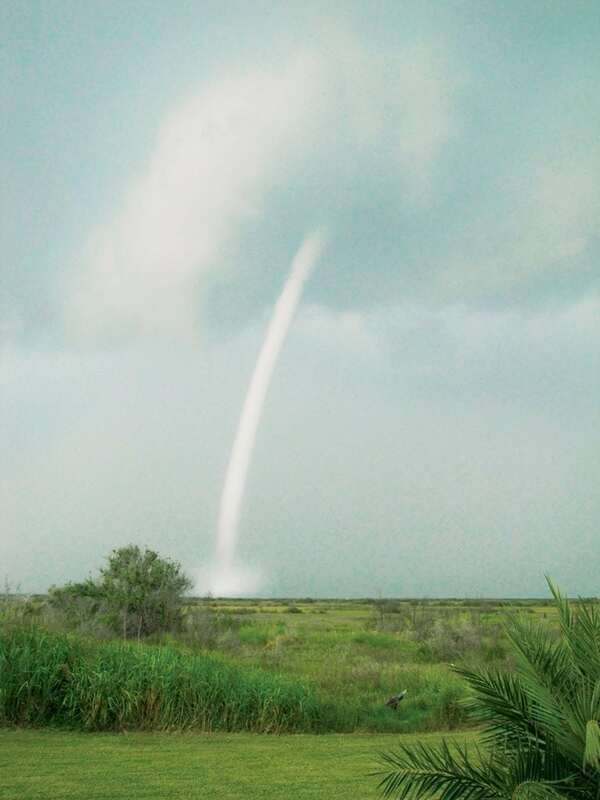 Spouts can occur anywhere along the Atlantic and Gulf coasts, especially in the summer. A number of research projects have indicated that the area surrounding the Florida Keys has the highest concentration of waterspouts in the world. During the southern rainy season, typically from late May into September, hundreds can occur. Even though these waterspouts are weaker, they can certainly damage a boat and, if they come ashore, can cause damage to property and injuries to beachgoers. Fortunately, fair weather waterspouts almost always dissipate quickly over land. Like tornadoes, tornadic waterspouts are produced by severe thunderstorms. These can be vortices that form over land and then move over water, or they can develop from strong thunderstorms over water, typically near the coast. They tend to be more common in the spring, but can occur at other times. These waterspouts are much more akin to their overland counterparts. 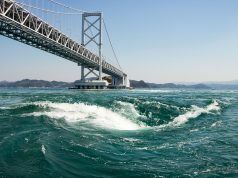 Very strong winds with speeds of more than 100 miles per hour are certainly possible, and the waves they can generate could capsize even larger vessels. If they move over land, damage can be extreme and even fatalities can occur. 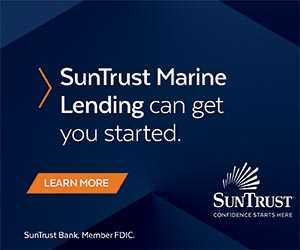 A recent example occurred this past April when a tornadic waterspout moved over Okaloosa Island, across Santa Rosa Sound and into Fort Walton Beach, Florida. 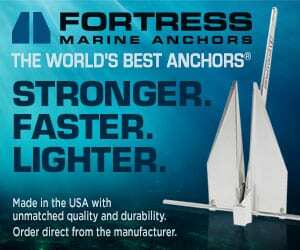 With estimated winds between 100-105 miles per hour, the storm tore the roof off a home on Okaloosa Island injuring two people and damaged parts of Fort Walton Beach. The conditions that form the two different types vary considerably. Tornadic waterspouts (and tornadic thunderstorms in general) develop in a very unstable atmosphere with significant temperature changes through its height. Ambient winds tend to be strong and change with height (causing wind shear). Often synoptic scale systems, such as fronts or low-pressure areas, are involved. Fair weather spouts develop in a more benign atmospheric environment with weaker winds and a consistently warm and moist atmosphere. Typically, there are no larger scale weather systems associated with their occurrence; however, smaller scale features or boundaries where winds change direction (land breeze fronts, outflow boundaries from previous convection) are often involved. Typically, a line of developing cumulus clouds rather than single clouds is noted. If conditions are ripe for fair weather waterspout development, they will often occur on successive days. Before you head out, check the latest National Weather Service (NWS) forecasts for the beach and offshore waters. If waterspout occurrence is possible, it will be highlighted. Tornadic waterspouts are somewhat easier to forecast because the atmospheric situation is more pronounced. Fair weather waterspouts are more difficult to anticipate, although meteorologists in places like Key West have developed forecasting schemes that help. When you are out on the water, continue to monitor weather sources for changes in the forecast. If a waterspout is seen or detected by Doppler radar (and many can’t be detected by radar), the NWS will issue a Special Marine Warning. The same is true when severe thunderstorms are over water. Then the warning would read “Severe thunderstorms capable of producing waterspouts.” Frequently check sky conditions for cumulus cloud development. If you see a waterspout, head at a 90-degree angle away from its apparent motion. Never try to navigate through a waterspout. If caught in one, make sure that all on board are in secure locations and wearing life jackets. Additionally, if a waterspout comes ashore (and officially becomes a tornado), the NWS will issue a Severe Weather Statement. A Tornado Warning will be issued if a waterspout comes ashore. Want more? Check out our Sea Watch archive. 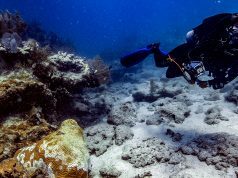 What is stony coral tissue loss disease?